Nalongo Judith Heard has joined the wagon of city MCs and will officially taste the waters tonight at the grand opening of Asylum bar based on Namugongo road. 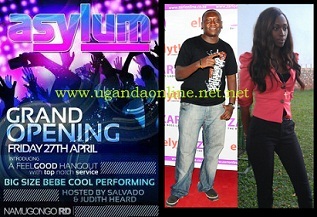 Bebe Cool will be performing and he is already calling up on his fans. Judith Heard hit the limelight when she was a Sylvia Owori Ziper Model as she did the catwalk. She recently opened up a Flaunt-Your-Style fashion shop at Forest Mall, she has a set of twin girls and normally takes off time to donate to charity. As a socialite, she has taken her love for the limelight to another level by trying out the role of being an MC something JH says she is doing for fun but also believes she can do it better than many MC's out there. Salvador was in full employment with a top telecom company before calling it quits to concentrate on his Comedy and MC roles.